Garnier was the first skincare I started using when I was a teenager. As I was growing, my skin needs were changing and I started using different brands to meet those needs. But the sweet memory of Garnier and their (then) green bottles will always remain. So when I was offered to test drive and write about the new Garnier 5 Sec Perfect Blur, I happily agreed. Their new product targets women in the 30-40 year range and so that’s me right now (time flies, I know!). “An instant airbrush effect!” that’s what the new Garnier product promises and for me it was intriguing enough to give it a go. Seriously, at certain point of life don’t we all just dream about erasing all those signs of sleepless nights, hard work and God knows what else. Wrinkles be gone! Equipped with the product that was awarded “Best innovation” launch by Boots in the UK I marched bravely into the bathroom to begin a new wrinkle free life. Did the product meet my expectations? Read my full review below to find out! 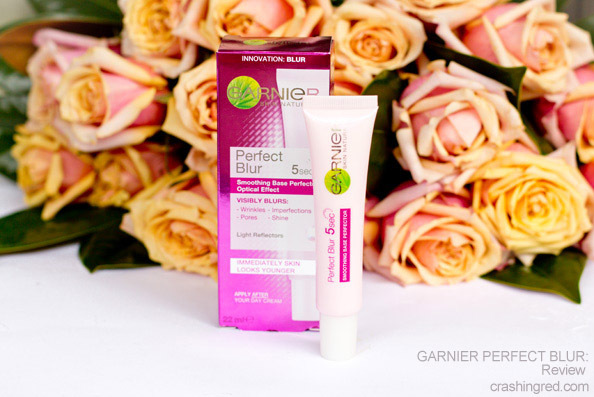 Garnier 5 Sec Perfect Blur – visibly blurs wrinkles, imperfections, pores and shine. A few seconds are sufficient for visibly younger, smoother, brighter skin. Apply after day cream on your entire face. It’s smoothing texture leaves skin soft and velvety with a matte finish. Can be worn under makeup or as a natural finish. Shake the tube before each use. Yes, Garnier 5 Sec Perfect Blur visibly blurs away wrinkles, you can see it in the hand shot below. The area where I applied the base perfector (‘After’ shot) does in fact look blurred. Because the wrinkles are blurred they are less distinct and the skin looks younger. I have also tried to wear this base perfector under makeup and it had a similar effect, it blurred away all minor wrinkles and provided a good base for foundation. Extra Notes: Personally I find the claim “blurs away wrinkles in 5 seconds” a bit misleading. While it actually blurs away the wrinkles when you apply it, the wrinkles will be back as soon as you wash it off. It’s not some kind of magical anti-ageing product that will blur away your wrinkles forever and it’s not skin care that will work towards reducing the signs of ageing. It’s a base for makeup and it does what it’s meant to do, smoothes your skin and preps your face for foundation. Just make sure you apply this primer after you’ve applied your moisturizer. Availability: RRP AUS $16.95 via Priceline, Target, Woolworth or any major supermarkets. 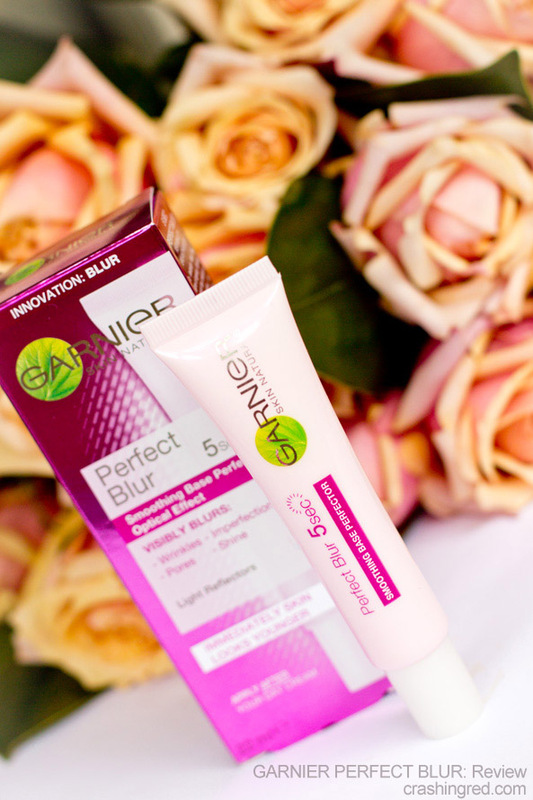 Personally, I’m quite satisfied with the results of the Garnier 5 Sec Perfect Blur test drive. Out of all the affordable primers currently on the market, I think this one is the best choice. It smells nice too! But if you prefer luxury skincare and makeup, it’s likely you won’t be impressed by this product. It’s more suitable for someone who is not ready to splurge $50 on a primer but still wants to own an effective product. If that’s you, you’ll love Garnier 5 Sec Perfect Blur. Now, the good news! I’m giving away 2 x Garnier prize packs each containing 3 x Garnier Perfect Blur products. So if you’re keen to try it, here’s your chance! How to Enter: simply comment on this post letting us know your thoughts about Garnier 5 Sec Perfect Blur and why do you want to win this product. Entry is open to all Australian residents aged 14 years and over. This giveaway ends at 5:00 pm AEST on Wednesday 16 April 2014. The winner will be chosen based on the most interesting answer. Full terms and conditions can be found here. 1 May 2014 Update: This giveaway is now closed and the winners have been contacted via email. Disclaimer: This is a sponsored post, opinions expressed are my own. My full disclosure policies can be found here. This product looks great, I tried a sample sachet of a similar blur product before and loved the results but still don’t have one of my own! I’d love to try this one out, especially to blur up pores and imperfections on my skin! I think this product looks interesting, I’m pretty keen on trying it out and seeing what it can do for my under eye creases/bags! Have never tried silicone based primer before so I’m very intrigued! I’m really curious about trying this product, the fact that the results wash off doesn’t bother me provided I don’t get stuck in a shower of rain whilst at work and return to the office looking 10 years older! Great blog post and review, first of all thanks for running the giveaway! I would love to win this product as I have tried the nanoblur by indeed labs but didn’t really work for me. I don’t have fine lines atm but would love to blur my imperfections for those days I don’t want to wear a full face of makeup. Look nice, count me in! I’m a mua and always on the look for a new decent primer. This product sounds very promising and I’m currently in love with the Benefit POREfessional, so a cheaper alternative would be great!